Three new crew members arrived at the International Space Station on Saturday after an overnight commute to their home and workplace in space aboard a Russian Soyuz spacecraft, making an express rendezvous with the orbiting laboratory to top up the Expedition 47 crew at six. 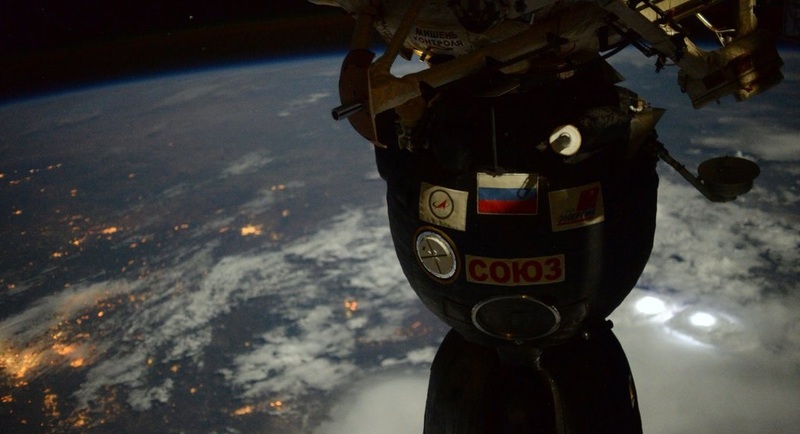 Alexey Ovchinin, Oleg Skripochka and Jeff Williams lifted off in the dark of night atop a Soyuz FG rocket at 21:26 UTC on Friday, setting sail on a half-year mission. Their Soyuz TMA-20M spacecraft received a smooth ride from the Soyuz rocket, delivering it to a precise orbit to begin its methodical climb to the orbiting laboratory. A fully automated rendezvous culminated in the successful docking of the spacecraft at 3:09 UTC on Saturday, under six hours after liftoff. 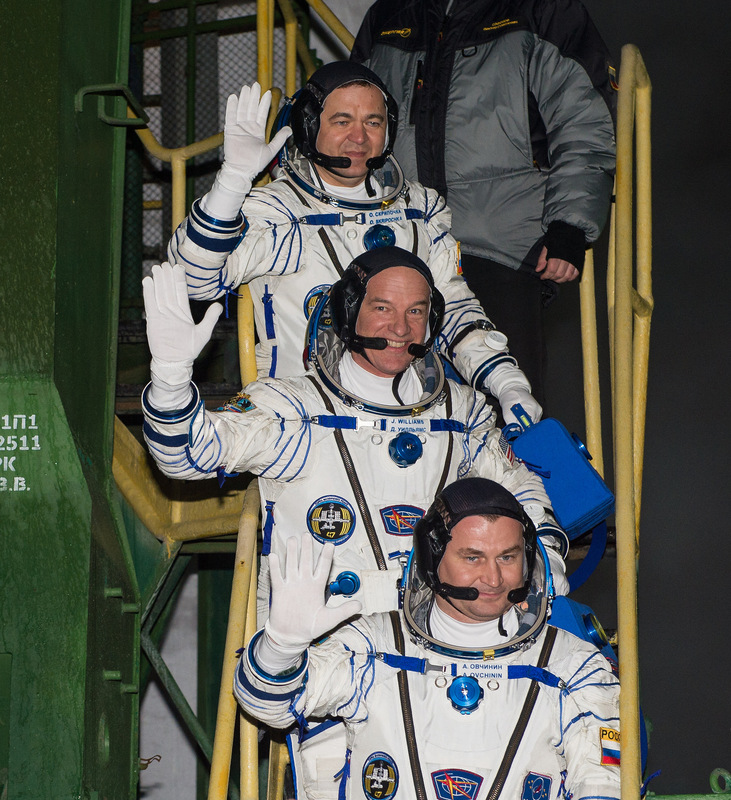 Arriving at the International Space Station, the Soyuz trio has been eagerly awaited by the resident crew of Tim Kopra, Tim Peake and Yuri Malenchenko. The full Expedition 47 crew is looking forward to a flurry of activities coming up in the next few weeks, starting with the launch and arrival of the Cygnus OA-6 cargo craft next week, a rotation of Russian Progress cargo ships at the end of the month and the arrival of the Return to Flight Mission of the SpaceX Dragon in the first half of April. Soyuz TMA-20M is booked for a stay of close to six months, undocking in early September. If the mission reaches its planned duration, Jeff Williams will pass the record for most career time spent in space by a U.S. Astronaut, recently set by one-year ISS crew member Scott Kelly. Williams is also the first U.S. Astronaut to embark on three long-duration stints aboard ISS. The three Soyuz TMA-20M crew members began their long work day eight and a half hours before liftoff when waking up for an eventful countdown and launch. While the crew was putting on their Sokol Launch and Entry Suits, their Soyuz rocket entered a two-hour fueling sequence to be filled with 274 metric tons of propellant prior to the boarding of the crew two and a half hours before T-0. 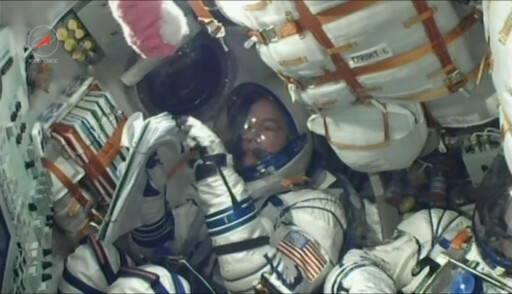 Taking their seats inside the confined space of the Entry Module of the Soyuz, the three crew members prepared their craft for the business end of the countdown. 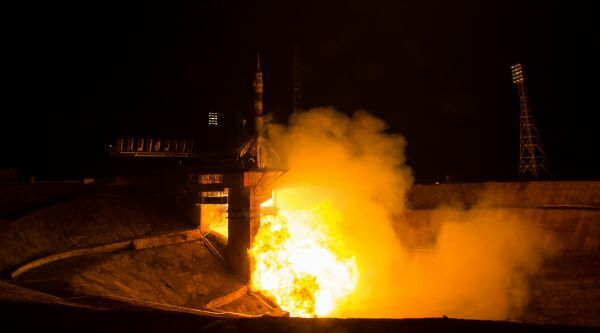 Revealed on its launch pad, the 50-meter tall Soyuz rocket headed into a six-minute automated countdown sequence to set the stage for the ignition of its powerful engines. 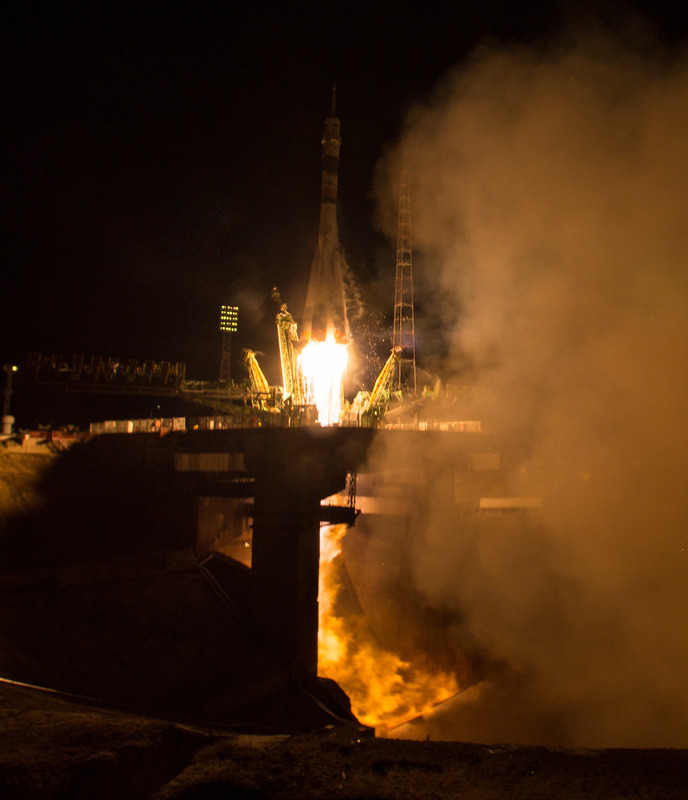 Soyuz rumbled to life and leapt of its launch pad at 21:26:38 UTC just three minutes after the Space Station flew over the Baikonur Cosmodrome. Swinging to the north-east, Soyuz began chasing the Station, heading towards orbit with a total thrust of 422 metric-ton-force supplied by its core stage and the four strap-on boosters. The boosters exhausted their propellant reserves at T+1 minute and 58 seconds and dropped away from the Soyuz that relied on its core stage to continue powered ascent. Two and a half minutes after launch, Soyuz had reached 85 Kilometers in altitude, making it safe for the Launch Shroud to be jettisoned, giving the crew a view of the outside as Soyuz approached its first sunrise in space. The core stage concluded its burn four minutes and 45 seconds into the flight and handed off to the RD-0110-powered Block I stage in the typical hot-staging sequence. RD-0110 fired for three minutes and 58 seconds, accelerating the Soyuz to orbital velocity and dropping it off in its target orbit. Soyuz TMA-20M was sent on its way eight minutes and 48 seconds after liftoff, reaching an orbit of 198 by 245 Kilometers at an inclination of 51.67°, all set to begin chasing ISS in its 400-Kilometer orbit. Although the most eventful part of the crew’s overnight commute to their out-of-this-world workplace was over, there was no time for a break due to the extremely tight timeline of the four-orbit rendezvous. Immediately after separation from its booster, the Soyuz successfully unfolded its two power-generating solar arrays, deployed the KURS navigation antennas and pressurized its propulsion system in advance of dampening body rates and getting ready for the first rendezvous burn. 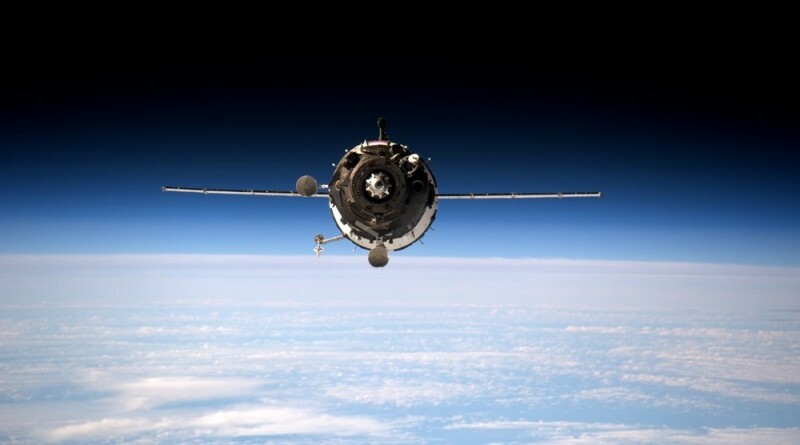 KURS, the radio navigation system needed for the link-up with ISS, was powered up and went through a series of three tests while Soyuz was still over Russian ground stations to verify the system was operational and ready for rendezvous operations. Previous missions, using the two-day rendezvous profile had the advantage of decompressing the testing on the Soyuz during the first & second flight day, but the luxury of getting to ISS within six hours of launch outweighs the schedule pressure according to crews who have taken a fast trip aboard the vehicle. With KURS up and running and Soyuz showing stable cabin pressures, the crew was allowed to open their helmets, doff their gloves and loosen the shoulder straps to settle in for four laps around the planet. To begin the process of raising its orbit straight away, Soyuz launched with a pair of engine burns programmed into its Flight Control System, to be executed during the first orbit, regardless of the actual insertion orbit parameters. The first burn was preceded by a re-orientation to the proper attitude for the maneuver and the opening of the main engine cover. DV-1, the first delta-v burn, was completed 46 minutes after liftoff, firing the 300-Kilogram-force S5.80 engine for 49 seconds to increase the vehicle’s velocity by 19.6 meters per second in order to raise the mean altitude of the orbit by 21 Kilometers. 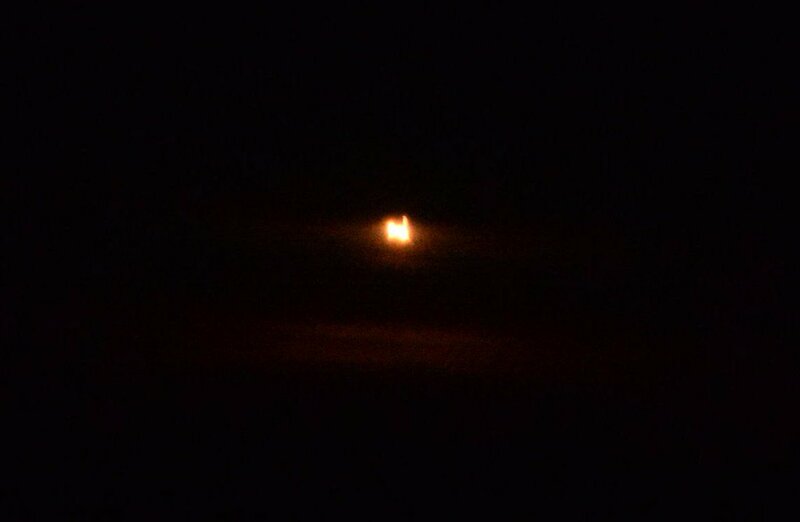 The second burn, 31 seconds in duration, targeted a delta-v of 12.4m/s, and was performed 90 minutes after launch. Minutes after the completion of DV-2, Soyuz entered ground station range again for a busy communications pass. First, updated burn parameters were uplinked to the Soyuz based on revised calculations using the measured orbital parameters, enabling the Soyuz to fly out the small insertion error to arrive in the correct spot for the initiation of the rendezvous. The second major activity was the checkout of Soyuz’s manual control system by Alexey Ovchinin who used the rotational and translational hand controllers to put the Soyuz through a manual flying exercise for the event a manual docking would be needed. Heading out over the Pacific Ocean again, Soyuz embarked on its second lap around Earth with another pair of burns, performed at the T+2-hour mark and the second occurring half an hour later, aiming for an orbit of 281 by 302 Kilometers to position the Soyuz for rendezvous initiation. The fully Automated Rendezvous Sequence was initiated at 1:03 UTC and began with another major engine burn, DV-5. This SKD firing placed the Soyuz on a course intercepting the 200-Kilometer zone around ISS where relative navigation was available. 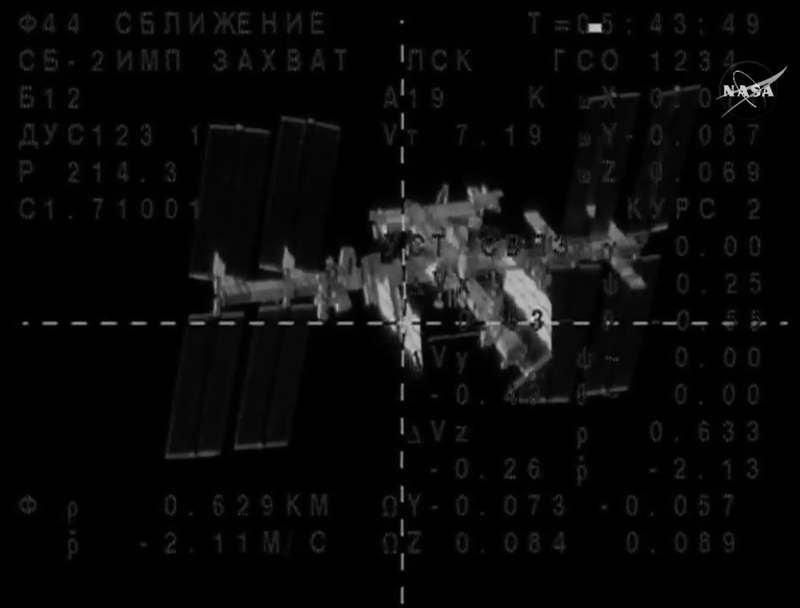 Passing 1:35 UTC, the KURS system on the Soyuz and its counterpart on ISS were activated with ISS transmitting signals received by the Soyuz for relative navigation. Initially, Soyuz made use of a pair of omni-directional AKR antennas the determine the basic direction of the incoming signal, followed by a re-orientation of the Soyuz to point its front end toward ISS. 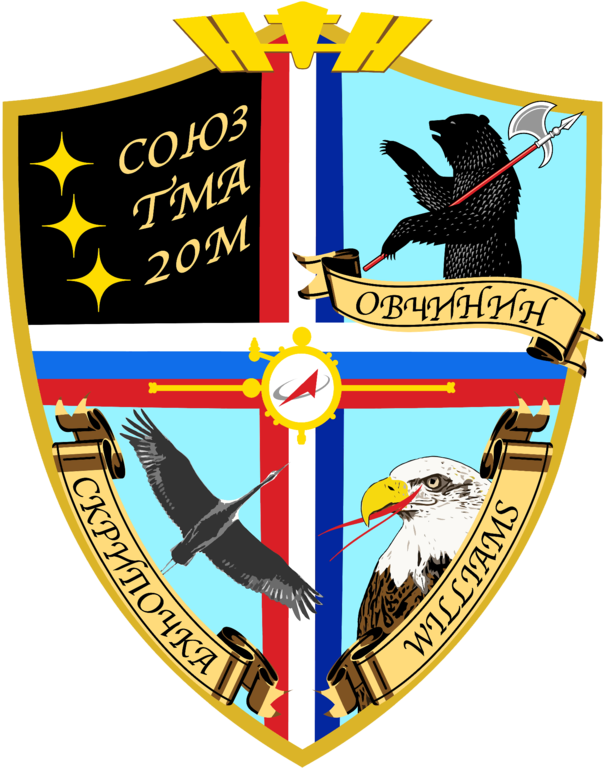 Once in a Line Of Sight (LOS) attitude, Soyuz began calculating heading and pitch angles through the use of the 2AO antenna. At closer range, the ASF-1 antenna became active to deliver range and range rate measurements plus heading, pitch and LOS angles for burn targeting during the approach. 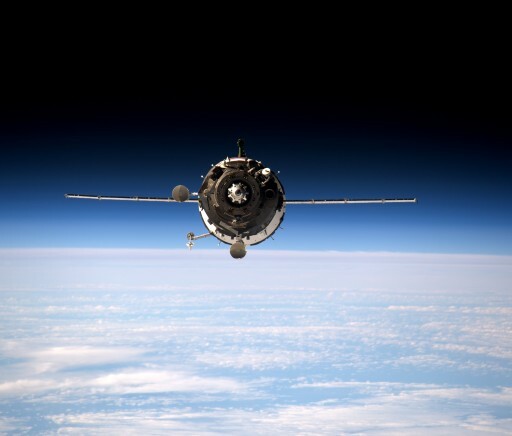 Soyuz sailed through the 1-minute and 17-second DV-6 rendezvous burn and checked the performance of the KURS system at 80 Kilometers to verify good data was coming from the navigation system. A VHF link with ISS was established as the Station came into play as a communications terminal, relaying calls between Mission Control and the Soyuz. Alexey Ovchinin and the two veteran Flight Engineers kept close watch over the progress of the rendezvous, ready to intervene in case of issues with the automated sequence, making another check of the KURS system at 15 Kilometers prior to three braking impulse burns. Heading into the last five Kilometers, Soyuz hit the brakes and fired its engines to slow down as ISS grew bigger and bigger as seen by the craft. 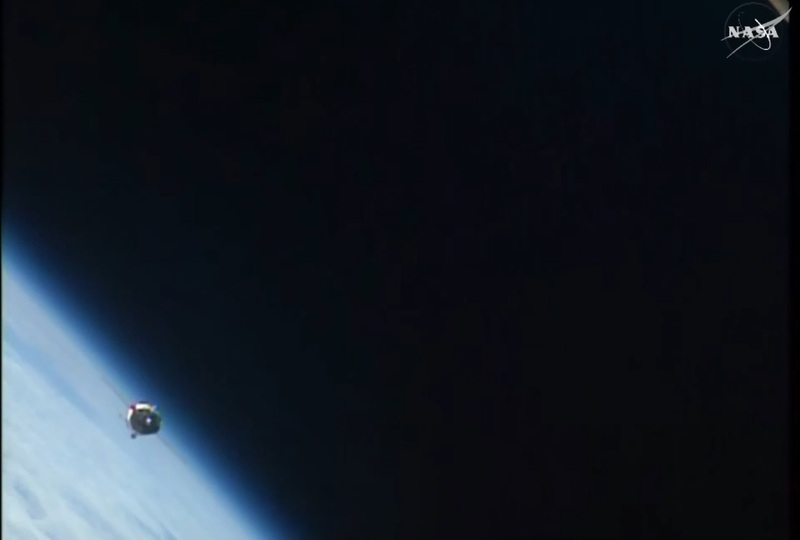 At a distance of 400 meters, Soyuz TMA-20M initiated its flyaround sequence, making a slow lap around the orbiting outpost to get lined up with the space-facing Poisk module. 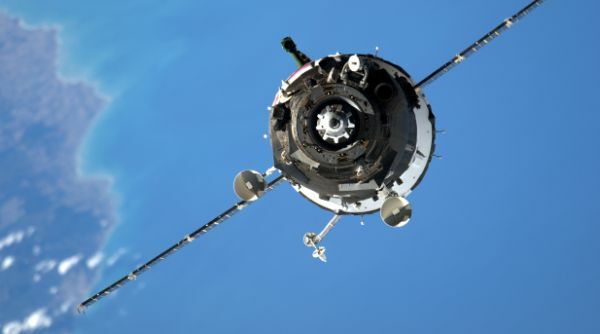 The spacecraft continued closing in on the Station while making its flyaround, guided by its KURS navigation system which remained in automatic mode with no issues whatsoever. Lined up with Poisk at a distance of 190 meters, Soyuz rolled to properly position its solar arrays and came to a halt to enable teams to make a short alignment and systems check before radioing up to the crew a GO for command final approach to start. Gently firing its thrusters, the Soyuz started closing in on its docking port at a slow rate while keeping its crosshairs perfectly aligned. The docking mechanism was powered up and the spacecraft retracted the 2AO KURS antenna in the last few meters of the approach to clear the docking interface. 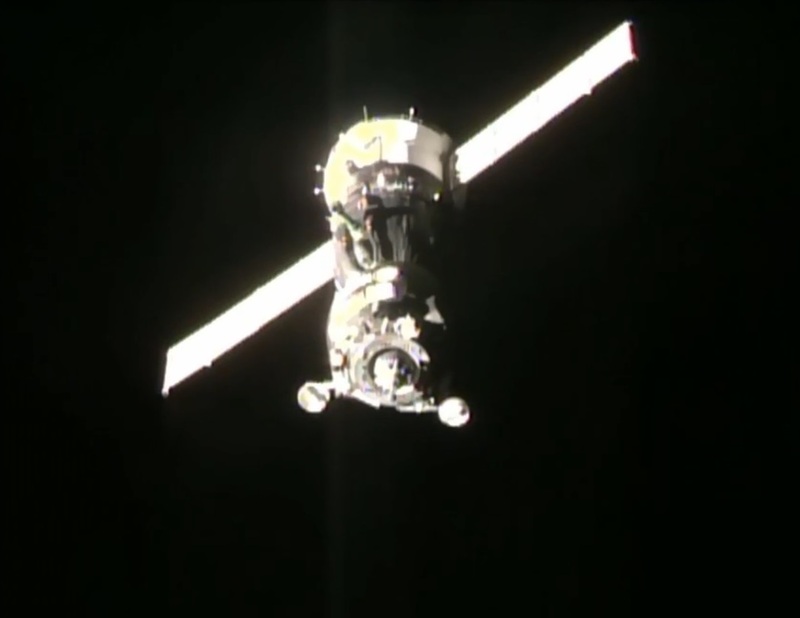 Contact and Capture occurred at 3:09:58 UTC as the docking probe slid into the docking interface and capture latches engaged to secure he Soyuz in place. 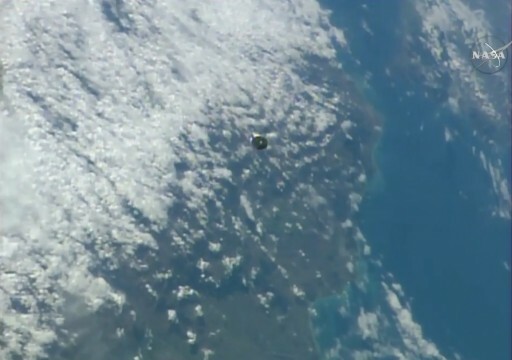 At the moment of docking, taking place 400 Kilometers above the Pacific, off the coast of South America, ISS went into free drift with all thrusters disabled while Soyuz completed a ten-second forward burn to make sure all capture latches locked. 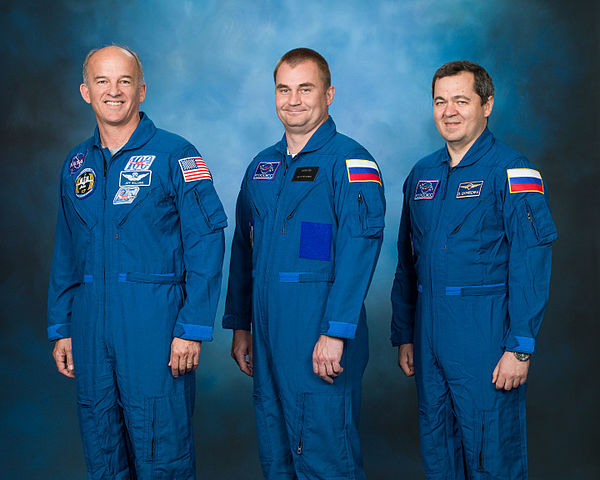 After their successful arrival at their orbital destination, the three crew members were finally able to take off their Sokol launch and entry suits and change into more comfortable clothing. Ahead of the crew prior to hatch opening was the typical one-hour leak check to ensure the pressure seal within the docking interface was tight as well as a series of reconfigurations of the power and communications systems of the Soyuz, transferring to hard-line comm and beginning power transfer from ISS. Hatch opening was completed at 5:18 UTC, allowing two returning and one new ISS crew member to float aboard their home in space for the next half year. The three Soyuz crew members were greeted by the resident crew, hugs were exchanged and quick stories of an eventful day were told. The assembled crew gathered inside the Zvezda module for the traditional video conference with their families who followed the progress of their journey from Baikonur after seeing them launch into space. To round up a very long day, the crew will walk through a detailed safety briefing – discussing emergency procedures, escape routes and the use of emergency equipment such as medical supplies, fire extinguishers and emergency air supplies. Later, the newly arrived crew members will set up their Sokols for drying out and transfer time-critical experiment materials from Soyuz to facilities aboard ISS. Soyuz Commander Ovchinin will deactivate the Soyuz spacecraft and put instrumentation in position for the docked mission. Also, quick release clamps will be installed in the hatchway to rigidize the docking interface and a ventilation line will be put in place. 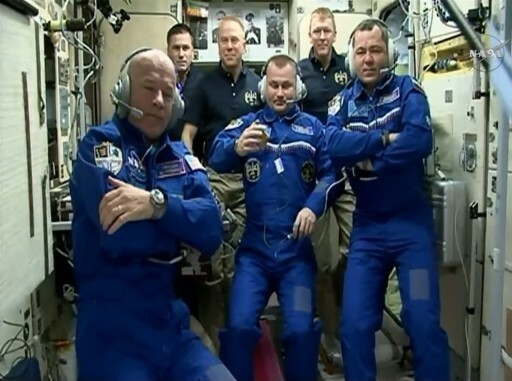 Before going to bed, the united crew will have some off-duty time looking forward to a quiet weekend before going back to normal work hours on Monday – beginning operations as a joint Expedition 47 crew. Expedition 47 has a rather packed schedule with multiple visiting vehicle arrivals and departures and the installation of a new temporary module on the U.S. segment of the station. Spacewalks are also planned for Expedition 47 to continue the outfitting of external systems for the first commercial crew missions, expected to arrive at ISS in the coming years. Expedition 47 is planned to see up to six visiting vehicle arrivals, starting with the docking of Soyuz TMA-20M. Next up will be the Orbital ATK Cygnus OA-6 mission, the second of two Cygnus missions launching on Atlas V rockets to bridge the gap until the new Antares 200 series is ready for its debut. Following the arrival of Cygnus, the Russian crew will see off the Progress M-29M spacecraft at the end of March, making room for Progress MS-2 set for liftoff and an express docking on March 31st. Throughout Expedition 47, the majority of the crew’s time will be dedicated to science operations, supporting over 200 studies ongoing aboard the orbiting laboratory.